T. Dell et al., The Dodge Collection, 1996, p. 29 (illustrated in situ in the Reception Room at Rose Terrace). P. Lemonnier, Weisweiler, Paris, 1983, p. 189, No. 212. P. Kjellberg, Le Mobilier Français, Paris, 1980, p. 91. This bonheur-du-jour is attributed to Adam Weisweiler on the basis of its similarity to other works by this famous maker. These include two other bonheur-du-jours of this model but with slight variations in the frieze and with different columns, one of which is illustrated P. Kjellberg, op cit, p. 866, the other, in the J. Paul Getty Museum, is illustrated C. Bremer-David, Decorative Arts, An Illustrated Summary Catalogue of the Collections of the J. Paul Getty Museum, Malibu, 1993, p. 22, No. 17. Although the Sèvres porcelain plaque and its decoration are 18th Century, it has not been proved conclusively that it was conceived to be mounted in this piece. Weisweiler worked in the main part for the great marchand-mercier Dominique Daguerre who was the principal purchaser of porcelain plaques from the Sèvres factory at this time. 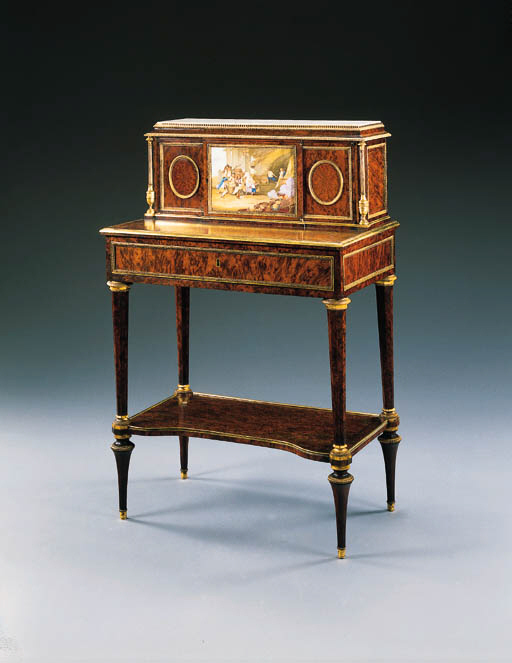 The mounting of furniture with porcelain plaques was still extremely fashionable in the early 1780's and Weisweiler was responsible for some outstanding pieces such as the Pavlovsk secretaire in this sale (lot 256). The central panel does not appear to have been altered and its reverse is still decorated with its original stringing. It has not been deepened to accommodate the relatively thick porcelain plaque but this would probably not have been necessary as the central panel is formed as a breakfront and as such would have been much thicker than the panels on either side. However the use of a rectangular porcelain plaque flanked by oval medallions with stringing is highly unusual. Similar military genre scenes, known at the time as Mignateurs, are relatively rare on Sèvres porcelain. They first appear on pieces painted by Jean-Louis Morin (died September 2, 1787) soon after the end of the Seven Year's War in 1763. Such scenes were also painted by Charles-Nicolas Dodin (died 1802/3). Plaques of this size were often intended to be framed as pictures rather than mounted on furniture. A framed wall plaque with similar military scene was given to King Christian VII of Denmark during his visit to the Sèvres factory in 1768 and now hangs in Rosenborg Castle, Copenhagen. Another, also painted with a very similar scene was sold Christie's London, November 29, 1990, lot 181. This had been mounted on a later secretaire. Such plaques, known as tableaux, are recorded from 1760 onwards and were particularly popular with the French Royal Family in the 1770's and 1780's, hence the presentation of one to the King of Denmark.